This winter has been crueler than most to Columbia, which received 16 inches of snow in January and a polar vortex of -40 degree temperatures in February. “We hear from both sides of the community when we call and when we don’t call a snow day. Columbia Public Schools (CPS) have had five snow days this year so far, mostly due to the aforementioned conditions. 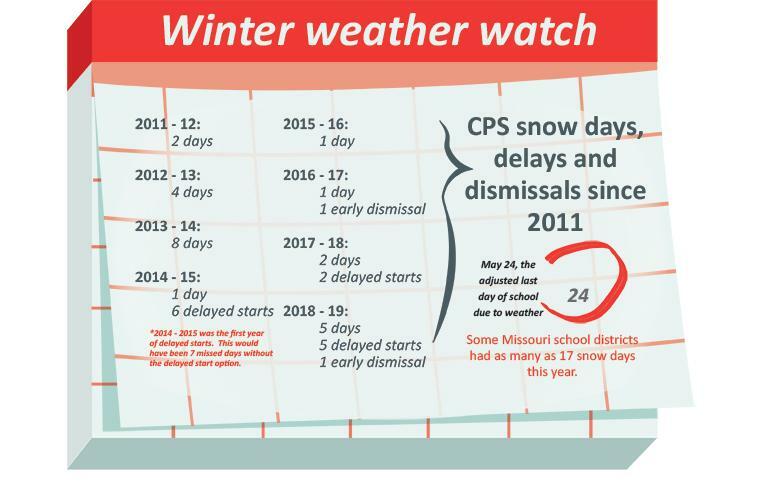 Since CPS inhabits the fifth largest school district in Missouri, making decisions on if snow days, early releases or late starts occur can be a challenging one with a juggling list of variables. Superintendent Dr. Peter Stiepleman makes certain various schools across the Columbia area he communicates with are well aware of the rationality behind each snow day decision. Every time Dr. Stiepleman announces a snow day, he delivers an email to school faculty members encouraging them to share the message with whoever they please. Dr. Stiepleman explains the reasoning behind calling snow days in these messages. This includes weather advisories, wind chill advisories, slippery roads and snow forecasts. Dr. Stiepleman and his “Snow Team,” consisting of nine other faculty members, including Community Relations Director Michelle Baumstark, make careful considerations when investigating and deciding the action they will take toward inclement weather. Because snow days are called based off of the next day’s forecasts, they can look unwarranted in hindsight. Freshman Rohan Rao doesn’t mind snow days but is annoyed at the setbacks they cause to school schedules. Not all students put emphasis on the downside of snow days. Junior Tony Jones sees snow days not just as a positive occurrence but as a necessity because he lives in an area that experiences harsher conditions from the winter weather. “Snow greatly affects my ability to get to school because I have three miles of gravel to drive every morning that does not get cleared if it snows,” Jones said. The two dynamics Jones and Rao present are both sides of a multifaceted dichotomy that Dr. Stiepleman and his board have to dissect in order to make the right decisions. While the board intends to call only the necessary snow days, predictions aren’t always accurate, and parents and faculty desire early notice. Baumstark said she and the rest of the “Snow Team” always make sure the safety of students is their top priority. She acknowledges that some decisions can look wrong in hindsight, but weather is always changing.